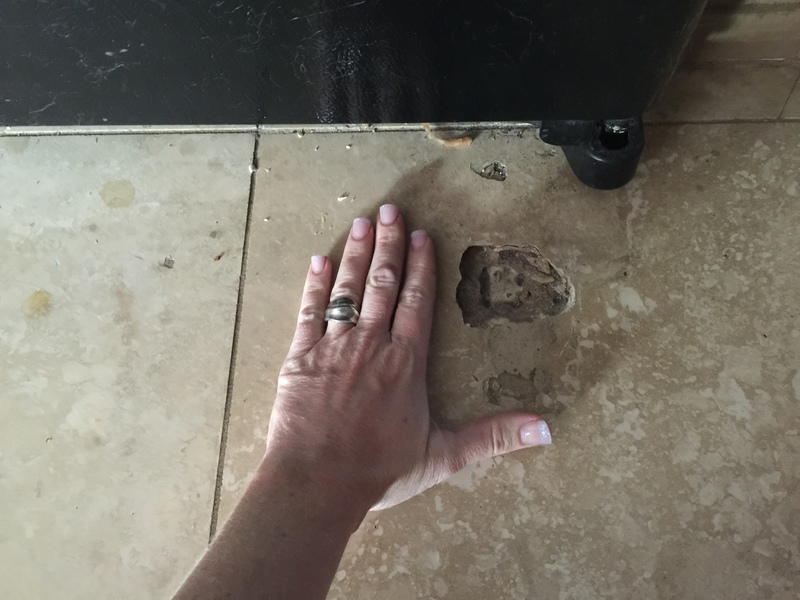 Do you have holes in your travertine? Are you missing grout? Looking for travertine tile repair? We can help! One of the most frequently asked questions we get is, “Why do I keep getting holes in my travertine tile?” The short answer, travertine tile is like Swiss cheese – full of holes all the way through it. When the raw travertine is cut into tiles, the surface holes are filled and then polished to a specific finish. Yet beneath the surface of the tiles, holes still remain. These holes, called vughs, typically differ in mineral composition from the travertine itself, which is composed mainly of calcium carbonate. These vughs could be composed of granite, quartz, salt, etc. If salt is among the compounds, it is likely acidic. Should this salt be exposed to water, it dissolves, and the acid is released. The acid causes the calcium carbonate to disintegrate, causing a hole to form. Since travertine polishing involves the use of abrasives to bring up the shine, it’s common for holes to form during the process. Depending on the size of the hole and number of holes, we either fill them with non-sanded grout or epoxy travertine filler. We offer travertine tile repair and grout repair as part of our tile cleaning service. We use a 2 part epoxy on the larger holes and sanded or non sanded grout on the smaller holes. We also offer baseboard caulking and grout repair. CALL TODAY. to schedule your free estimate or for more information regarding your travertine tile repair job.